Looking around the dining room at Luca is rather like casting your beadies over a good handbag; from a distance, it looks very similar to other handbags, but when you examine more closely, the quality becomes clear: a beautiful finish on a buckle, excellent stitching, quality leather. The dining room at Luca, at first, feels like it could be anywhere, until you notice the bevelled edges on the tables, the art deco styling, elegant cutlery, and the little gold clip-tray that pinches your bill. The food, too, could be accused of feeling like other restaurants. 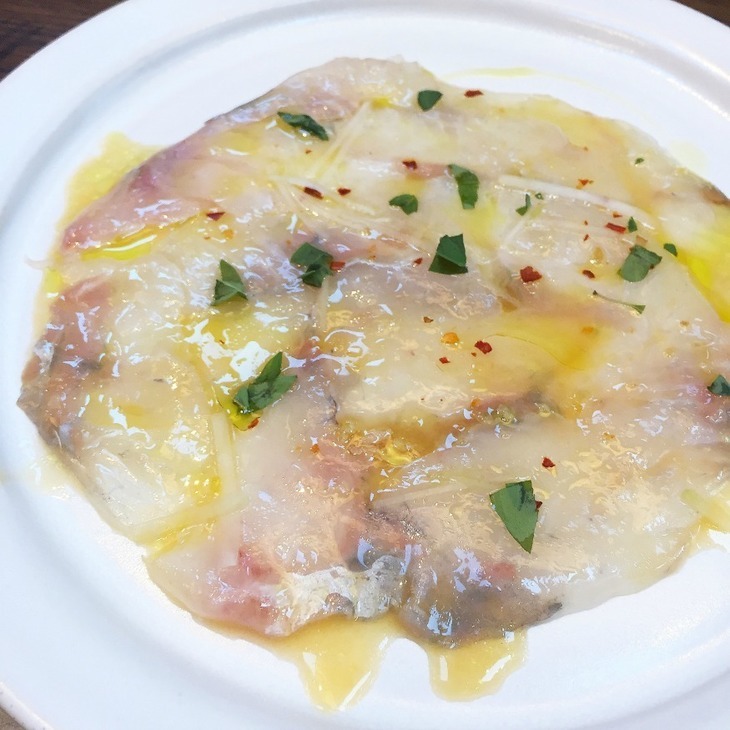 We've seen some good quality Italians in London, particularly in recent years, but at Luca, they're doing something slightly different — serving a British menu, 'seen through an Italian lens'. On the menu then you'll find Morecambe Bay shrimp in the spaghettini, and grouse ravioli with whisky sauce. Does it work? Well, kind of. 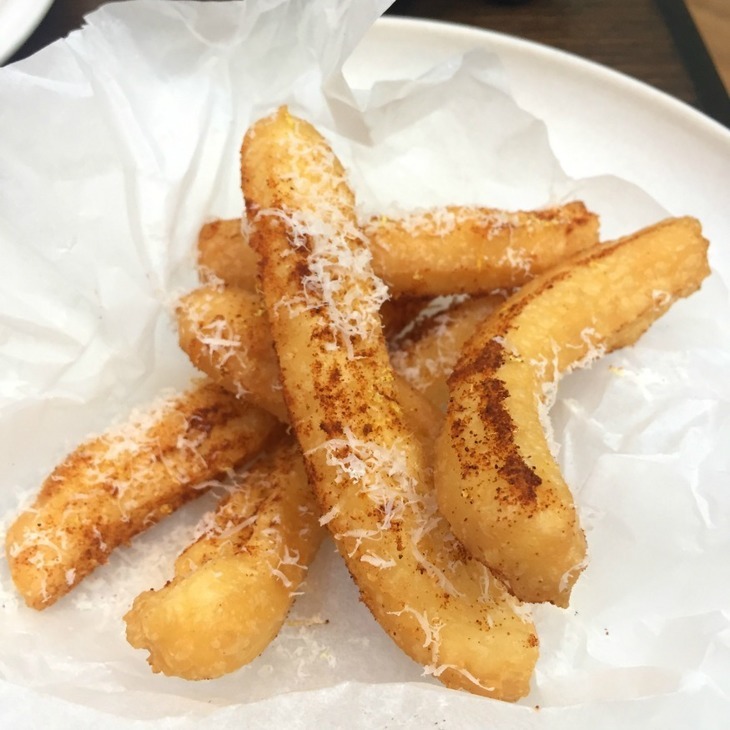 We start with some fluffy Parmesan 'chips' which are the snack you'll most associate with the clever, playful cooking at Shoreditch's Clove Club (Isaac McHale, Daniel Willis and Johnny Smith of that restaurant are also behind this new venture). These 'chips' have been described everywhere online (i.e. Instagram) as being like 'savoury churros', which is true, but they also conjure dreams of high-grade Wotsits made fluffy, their intense cheese flavour from parmesan MSG. A crudo (raw) dish of finely sliced 'sea robin' (it’s a prettier name for gurnard) is dressed with festive clementine, marjoram, excellent 'capezzanna olive oil' and a spiky sprinkle of chilli; the quality of ingredients keep it from tipping over into boring territory but really, only just. Best by far is spaghettini with shrimps and mace butter, the rich, bisque-like sauce coating properly al dente pasta. It's a stand out dish, gone in moments. Don't wear a white t-shirt. 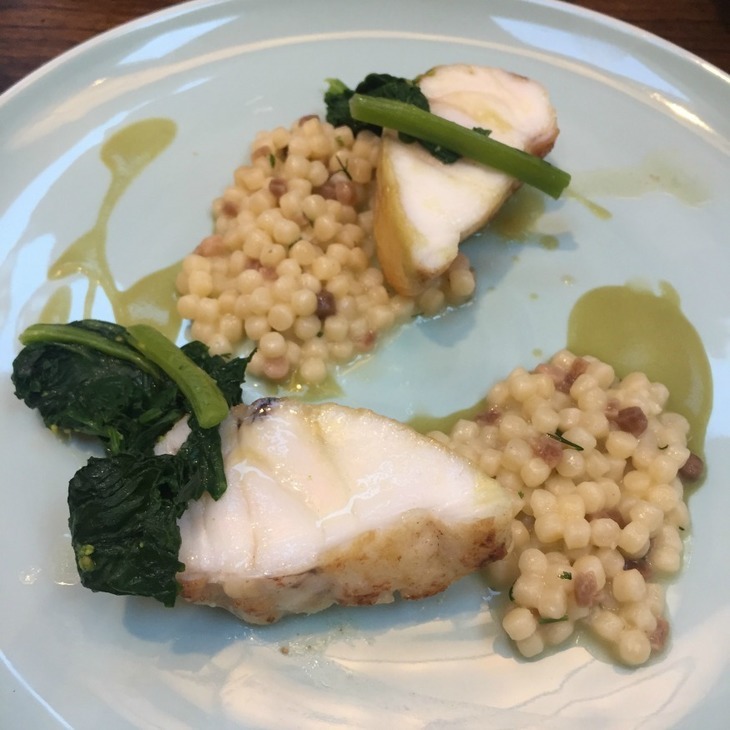 A main course of monkfish with fregola sarda (a sort of toasted Sardinian pasta) with green olive sauce is… well… it's… um. Oh dear. Everything is there, on the plate. It's all present and correct. Nothing is bad. It's not overcooked, undercooked or poorly seasoned. There isn't a hair in it. It’s just… a bit boring. Monkfish with fregola sarda and green olive sauce. There are no fireworks at Luca, then, and perhaps it's more of a slow burner than a wave-it-in-your-face with a marching band arrival. 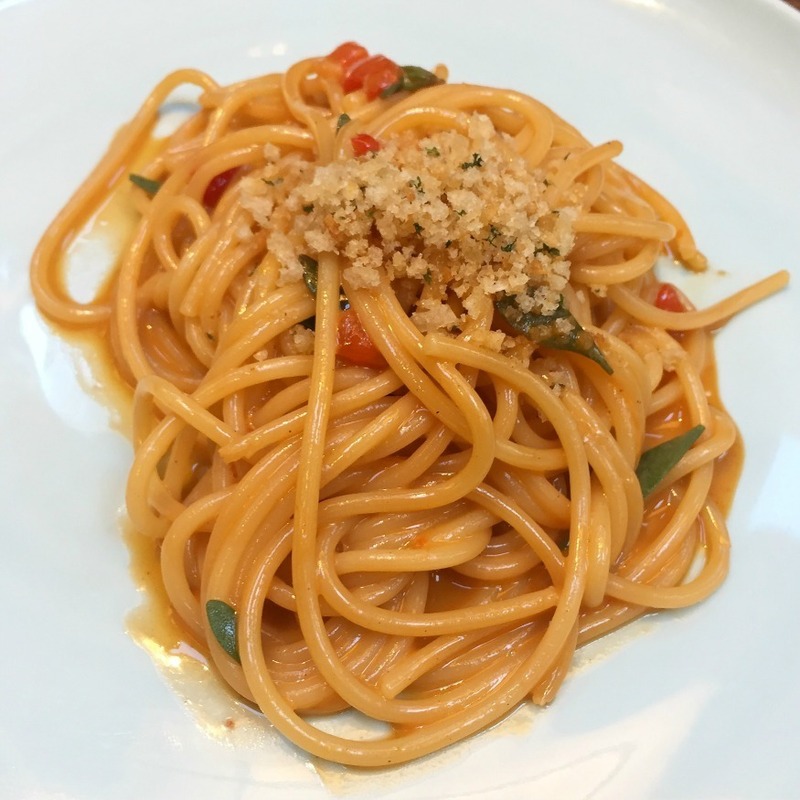 The thing is, they're doing a lot of things right — there's the handmade pasta, the impeccable sourcing, the fantastic, poppy seed crusted bread. The problem is that if you're going to open a restaurant off the back of somewhere like the Michelin-starred Clove Club, people are going to want wow, and when what they get is a plate of rather bland fish and a bill that's £110 without any drinks or desserts, they could get a little pissed off. Maybe Luca will be — and we genuinely hope it will be — a slow burner. These are fantastic restaurateurs, some of the best, and maybe, like that good handbag, we're looking at a reliable mate for life rather than a one-time cheap thrill. The devil really is in the detail.